32 Today we all sat on the floor and played with the hover puck. Each class made observations, and we talked about interactions. Today was the first time students saw an interaction diagram. It was a first for me, too. I have never used them. I think they started being used after I took Modeling Instruction workshops in 1997-98. 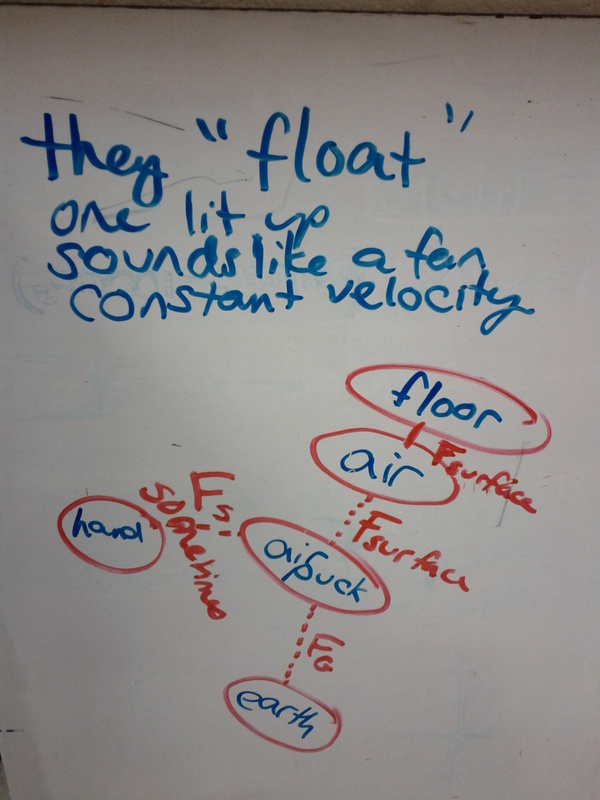 Anyway, the students seemed to think it makes sense as written. I praised the student who said it sounds like there is a fan inside the puck, since we could not see the fan so it is not a direct observations. We also checked whether the puck could be said to “float” by sliding paper underneath. One class wanted to send the puck all the way down the hallway, so we did that.